Two trends that have evolved over the last several decades have contributed to increasing the value of supply chain management and S&OP. More agile and accurate management of supply chains has become more important because corporations worldwide have become less vertically integrated and therefore more dependent on suppliers. The second is globalization: Compared to 20 years ago, corporations are sourcing products and services from global suppliers and selling to customers around the world. Longer supply and demand chains are more difficult to manage with agility and accuracy. Yet it’s been our observation that, with limited exceptions, executives are lagging in their understanding of the performance improvements that are possible using SCM and S&OP software. A recent event shed some useful light on how this might be done. Kinaxis, a vendor of cloud-based SCM and S&OP software, recently held its annual user conference, Kinexions. The event was notable for its focus on helping the company’s customers improve their supply chain execution and S&OP. Its RapidResponse software enables companies to manage complex, multi-tier supply and demand chains more effectively. Using it, organizations potentially can react faster with greater intelligence to changes in market dynamics and have more immediate visibility into the condition of their supply chain. It also enables organizations to quickly create and evaluate scenarios either for planning purposes or to assess different courses of action in response to market changes. This might include the need to allocate available inventory to preferred customers when supply disruptions due to weather or natural disasters occur or to locate additional sources of supply. RapidResponse’s differentiations are its ability to handle the most complex supply chain structures and its flexibility to adapt to a company’s business requirements. The keynote addresses of software companies usually are heavy with lists of product enhancements. RapidResponse is both a mature product and one that is continually refined to offer measurable improvements in supply chain execution. While product enhancements certainly were covered, most of the break-out sessions were customer presentations detailing their use of RapidResponse to implement new supply chain management capabilities. Many of these sessions covered ways to overcome organizational inertia and other obstacles that can impede progress. Shortly before the event Kinaxis announced the availability of its expanded Integration Platform for RapidResponse. This is designed to simplify the integration of data from internal and external business systems including, for example, ERP systems, data stores, warehouse management systems, trading partner sources and external data collected through robotic process auto­mation systems. 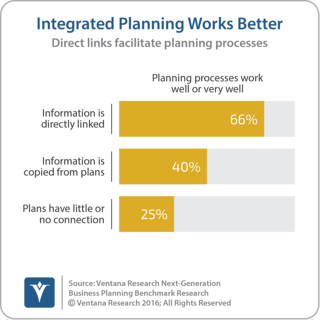 Our research finds that such systems improve the quality of plan­ning processes: 66 percent of com­panies that directly link information used in their planning processes have a process that works well or very well compared to 40 percent that rely on manual copying and 25 percent that have no links. RapidResponse has evolved over the years to support some of the most sophisticated SCM and S&OP techniques and processes. For example, the same enhancements in computation power and advanced algorithms that enable a machine to beat a chess grandmaster also make it possible to perform concurrent supply-chain planning. Concurrent planning, now available in RapidResponse, eliminates virtually all the latency in arriving at a solution that can be found, for example, in cascading planning, where each echelon of a chain is calculated serially. Since in cascading planning the steps are computed individually and each is dependent on the results of the previous work, the process can take substantial time to complete. And several iterations of a calculated plan may be necessary to arrive at a workable solution if there are constraints that must be considered, even if they are not explicitly modeled. For this reason, optimization in complex supply and demand chains often will involve some degree of human judgment. Because it makes it possible to see the impact of multiple options quickly, concurrent planning provides a time frame in which organizations can have a dialog about which option is best. Being able to have a data-driven dialog about potential outcomes improves a company’s ability to plan collaboratively across business units and departments. A lack of coordination between functional and geographical company silos results in inefficient inventory control, with too much of some and too few of other items, which raises the cost of goods sold, slows inventory turns, increases accounts receivable and has a negative impact on customer satisfaction and competitiveness. 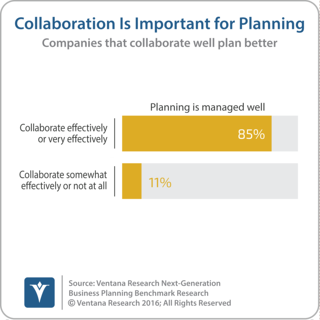 Our Next-Generation Business Planning research confirms that effective collaboration is important for a well-executed planning process: nearly (85%) of companies that collaborate effectively or very effectively have a planning process that is managed well compared to just 11 percent of companies that do not collaborate effectively or at all. No user conference today would be complete without a discussion of artificial intelligence (AI) and machine learning (ML). Kinaxis’s vision is a system of automated – not artificial – intelligence that enables a self-healing supply chain. Self-healing means that events that require some intervention to, say, cancel, delay or accelerate supplier orders will be done automatically. Kinaxis recognizes that the complexity of the analyses necessary to address its customers’ thorniest issues will impose near-term limitations of what AI and ML can achieve, and so suggests the greatest impact of these technologies’ will be on enhancing supply chain managers’ productivity and effectiveness by automating routine decisions. The Internet of Things (IoT) also fits into this picture – for example, by extending the ability of the supply chain management system to sense the position, movement and condition of items in the supply chain in real time. With this capability, the systems will be able to react appropriately without human intervention. For example, if out-of-tolerance temperatures or g-forces are experienced by a container in transit, a replacement order workflow could be kicked off, the inventory impact would be calculated and adjustments to manufacturing and supply chain plans would be made, all automatically. Our research finds that a large majority of organizations have challenges doing supply chain- and sales and operations planning. One significant issue is visibility into supply chains. Just 11 percent of companies can drill down into the underlying details of their supply chain data to be able to better understand the why behind the what. Only 29 percent of companies can explore all relevant scenarios in developing a supply chain plan. Just 33 percent say their S&OP plans remain relevant throughout the planning period. Those doing supply chain planning and management as well as S&OP face an interrelated set of people, process, data and software issues. For instance, more than half of the participants in our research said that the executives in their companies do not communicate supply chain planning requirements well. And more than half (53%) of those involved in a company’s supply chain planning are dissatisfied with the process. One likely reason for these issues is that companies rely heavily on spreadsheets to manage their supply chain planning (80% of participants) and S&OP (75%). Desktop spreadsheets are not suited to the task of managing even modestly complex supply and demand chains. The market for supply chain planning and S&OP software is crowded. Kinaxis competes with, among others, Anaplan, E2Open (Steelwedge), JDA Software, John Galt Solutions, Logility, Oracle, River Logic, and SAP. In this crowded space, Kinaxis competes on its ability to tackle demanding and difficult supply chain planning and management environments. Larger companies with complex and extended supply chains should periodically assess whether they can improve their performance with more effective software for supply chain planning or S&OP. I recommend that they include Kinaxis in that evaluation.